Bernardo Pasquini (1637-1710) was Rome’s leading harpsichordist and organist at about the same time as Corelli and Alessandro Scarlatti. Indeed, all three became official members of the Arcadian Academy on April 26, 1706. His Passion oratorio La sete di Christo (Modena, 1689) is a philosophical discussion between the Virgin Mary, St John the Evangelist, Joseph of Arimathea and Nicodemus as they are witnesses at the Crucifixion and contemplate the deeper significance of the fifth of Christ’s seven last words (‘I thirst’). The sinfonias introducing both parts of the oratorio locate Pasquini’s musical aesthetic somewhere between Stradella and Corelli; in particular, the Largo at the beginning of Part 2 is played plangently by Concerto Romano’s small group of single strings. The action (such as it is) commences with a succession of mournful and contemplative musical passages for the Virgin Mary, responded to by madrigalian trios from the lower voices – all components are sung with dignified sensitivity for musical shaping and text. 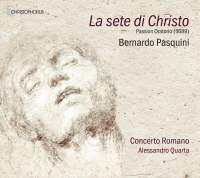 Francesca Aspromonte’s fresh-voiced Virgin sings deliciously in counterpoint to succinct string ritornellos in music that ebbs and flows gracefully and emotively, and she concludes the oratorio with a deeply affecting musical evocation of the Pietà. Luca Cervoni’s experience singing in small groups (such as Concerto Italiano) informs his gently beseeching and beautifully enunciated performance of Giuseppe d’Arimatea’s laments. Francisco Fernández-Rueda probably has a beefier tenor in normal everyday life than is given free rein in his ardent performance as San Giovanni: ‘Tutto piaghe’ is an eloquent description of unbridled grief wrapped up in descending chromatic gestures and doleful string-writing, whereas ‘Trema il suolo’ is a dynamic illustration of the simile text’s reference to an earthquake. Bass Mauro Borgioni sings Nicodemus with a smoky urgency. Alessandro Quarta’s direction nurtures the pious discourse discreetly – other than some rare instances of loudly accompanied recitatives, one seldom senses any obstructive micro-management.